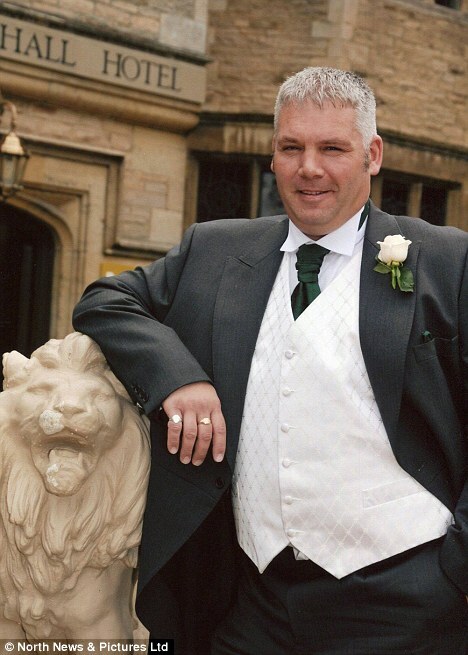 A husband who tried to bludgeon his wife to death whom he met on Friends Reunited has been jailed for 12 years. Iain Hardy, 40, attacked his wife with a hammer because he was worried she would discover his financial woes. Hardy married his former schoolfriend Danielle, 40, after they met again through Friends Reunited in November 2008. The pair first met at school aged 12, but hadn’t seen each other since they left Carmel School in Darlington, County Durham, in 1987. Then in November 2008 they were reunited, after Hardy sent Danielle a message over the Friends Reunited social networking site. Romance quickly blossomed between the old friends and they quickly married and settled into what Danielle, who was in her late 30s at the time, thought was the 'perfect' life. But on March 19 this year, a little over three years since they were reunited, Hardy attempted to bludgeon his wife to death with a 2.5lb hammer, Teesside Crown Court heard. Danielle was working at her computer desk at their home when Hardy crept up and without warning brought the heavy weapon down on her head repeatedly. 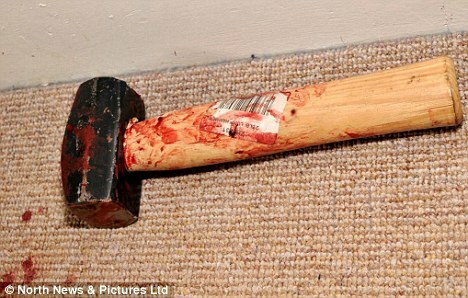 The two-and-a-half pound weapon was smashed into Danielle's head in what police called a ‘cool and premeditated’ assault. Danielle, branded ‘the luckiest person I know’ by the detective who lead the investigation, somehow survived the attack. She had two wounds to her head and doctors suspect her skull was fractured by the man she thought she knew and loved. Police now believe that Hardy, who told his wife he was a globe-trotting, successful businessman, was a penniless fantasist and was terrified of his financial troubles being discovered. Speaking about the attack, Danielle said: ‘There was nothing strange happening, nothing at all. I was sitting at the computer when it happened. ‘There was an almighty bang, not a sound, just a bang inside my head, and I sort of shouted 'Iain, what the . . .' and put my hands up. ‘I saw him with the hammer. He stopped and said "Let's take you to hospital". He went out of the room and must have gone downstairs. Danielle added that she was hit more by shock than physical pain. She didn't know what Hardy was thinking or what he was expecting to achieve. ‘I hope at some point there will be an explanation for it, but how do you explain it in any rational way - "things were that bad, I thought I'd try to kill you",' she added. Danielle was blissfully unaware of Hardy's web of lies, believing he was a successful businessman. But as police dug into his past the truth emerged about Hardy's double life. He claimed that while he had travelled the world in high-powered jobs, he had suffered the devastating loss of his wife and daughter. However the 'cherished' photo of his late wife and child that he showed to Danielle was a sham, the people in the picture were total strangers. And the comfortable existence his professional life afforded was also a figment of an imagination friends said was evident at school. Other former classmates have since said he was always known for telling tall stories and described his as a Walter Mitty character. ‘Hardy has lived a life of lies and deceit since school, he has lied to his family, his close friends and his wife. ‘He claimed to have lost a wife and child in a road accident, claimed to have fought cancer, lived abroad and had even recently had a cash offer accepted on a house that he did not have the funds to purchase. These were all found to be lies. Danielle, swept along by the romance of being contacted by a friend she had known as a 12-year-old, never imagined that their relationship was built on lies. She said: ‘The pain of the injuries was horrific, but what is worse is that I now know I did not know him or why he did this. 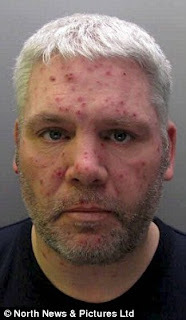 Hardy, of Darlington, County Durham, pleaded guilty to attempted murder and was sentenced to 12 years in prison.